Google Chrome is the most popular web browser. Most of the android and windows users prefer chrome browser over any other web browser in the market. Still, chrome browser has a lot of bugs and the most annoying bud that chrome users are facing these days is the “ERR_EMPTY_RESPONSE” bug. This Error limits the user to sign into any website. The bug stops you when you are about to about to sign into any website and shows a pop “ERR_EMPTY_RESPONSE”. This gets very annoying when you have to login to any website using your credentials. Luckily, we have few solutions to fix this error and sign in to any website using Google chrome without any kind of hassle and today, we will be sharing these Solutions with you. Let’s quickly get started. Low or unstable internet connection can also be the reason of “ERR_EMPTY_RESPONSE” error. So, you must check your internet connection before logging into any website using Google chrome. There are many ways by which you can easily check your internet downloading and uploading speeds. There are many software’s and even websites available on the internet by which you can check whether your internet connection is stable or not. If you found your internet connection not to be stable then contact your internet service provider and tell them to fix this issue but if your internet is working perfectly fine and you are still facing “ERR_EMPTY_RESPONSE” Error while logging into any website then follow the other solutions mentioned below. Now, if the above solution didn’t helped you to fix “ERR_EMPTY_RESPONSE” Error then there is a strong possibility that this one will get the job done. In this solution, we will be discussing about clearing your browsing history as the problem can be related to it to. So, just clearing browsing history once. If you don’t know, how to clear your browsing history then just read the steps mentioned below. Step 1- Open Google chrome on your PC. Step 2- Press Ctrl+Shift+Delete keys together on your keyboard at the same time. Step 3- Now, you will see a popup window which shows your data clearing settings. You have to select the time from the very beginning and make sure to tick all the boxes that are given in that window. 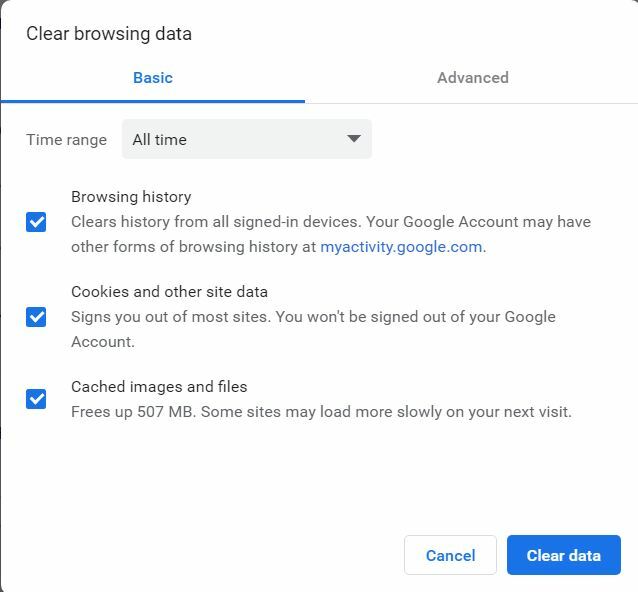 Step 4- After that, simply click on “Clear browsing data” option and it will automatically clear all your browsing history. Congratulations! Your browsing history has been completely cleared and “ERR_EMPTY_RESPONSE” Error might have fixed by this solution but if you are unable to fix this error then don’t get panic and follow the other mentioned methods in this list. This a bit complicated solution and it is only for people who are not able to fix that error by using the above 2 methods. 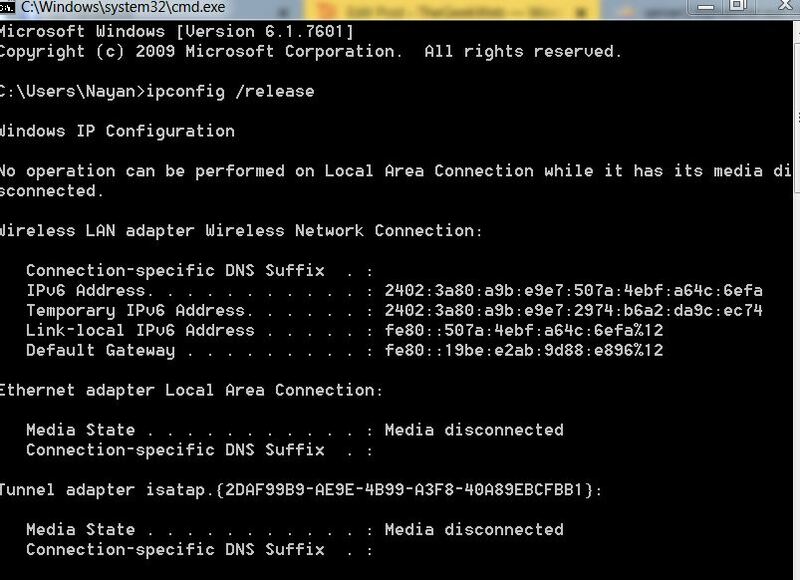 There is a strong possibility that something is wrong with your network settings so you can just fix it by resetting your network settings by following the steps which are mentioned below. Step 1- Open Command prompt on your computer. You can simply open the command prompt on your Computer by going to the start menu and searching for the command prompt. Step 2- A huge black window will appear, now you type the following compounds in the command prompt. Make sure to enter after typing Each and every command. Step 3- After that, Reboot your computer. Your Network settings have been successfully Resetted. Now, the error might have already fixed. If you are still facing the same error then don’t lose hope because there are 2 more solutions given below. Old drivers can also be a reason for “ERR_EMPTY_RESPONSE” Error. You can fix this error by updating your drivers. Now, if you don’t know that how you can update your computer drivers then follow the steps given below. Now, you can manually update the drivers of the components of your Computer by downloading the latest drivers for each and every component of your computer but we will recommend you to do this process by the help of any software. There are many software’s which will help you to update your drivers. Our recommended software is Driver Easy which scans the components used in your PC and downloaded the latest drivers for them. Step 1- Download and install Driver Easy on your PC. Step 2- Once, you have successfully installed this software on your PC then Open the application. You will see a green box which says “Scan Now”. Click on that option and it will scan for the latest drivers available for the components of your computer. Step 3- Now, you will see a complete list with all the latest drivers. You have to select and update each and every driver manually from here because you are running the free version i this software. If you buy the Pro version of this application, you will be able to use the “Update all” option which will let you update all the drivers at once. Congratulations! Your Drivers have been successfully updated. Now, the “ERR_EMPTY_RESPONSE” Error Might have already fixed after you update all the drivers. If all of the mentioned methods were not able to fix “ERR_EMPTY_RESPONSE” Error for your chrome browser then there must be something wrong with the chrome browser installed on your computer. You should reinstall the chrome browser. Just uninstall the chrome browser and download its latest version from the Chrome browser and install it again on your computer. This can also fix “ERR_EMPTY_RESPONSE” Error. If you are still not able to fix the issue then download any other web browser. You can find a lot of other good web browsers just like google chrome. Try logging in to any website using those browsers. You can download Mozilla Firefox, Opera etc from the internet and use them for logging into websites until google does not fixes this bug with the google chrome. These were some solutions which can help you to Fix the “ERR_EMPTY_RESPONSE” Error in your Google chrome browser while logging into any website. Now go ahead and try them out and see which one of these steps are working the best for you. Also for any questions, do feel free to leave a comment.